Condition Dog News Firefighters First Responders Heroic Humans Injured International Rescue Social Media Video Viral Video Wow! 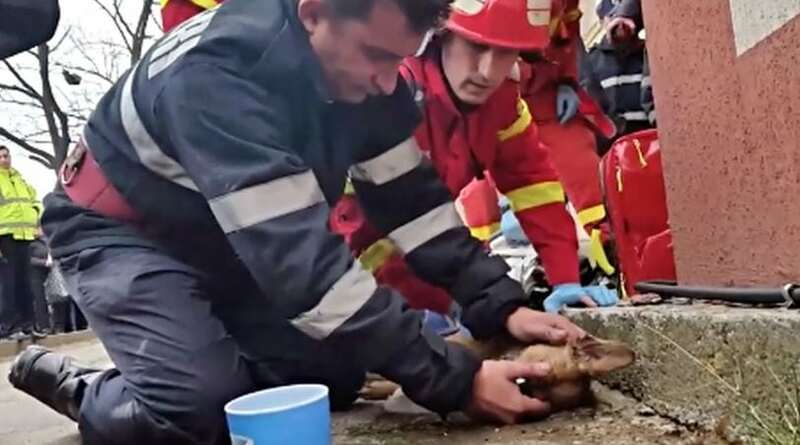 Romanian firefighter Costache Mugurel has been called a hero by many after video of him saving the life of a dog overcome by smoke inhalation when viral. A Romanian firefighter is a small dog’s hero, and likely that of its owner, as well. Dramatic video posted to Facebook shows him saving the dog’s life by performing CPR and mouth-to-mouth resuscitation. “Nobody gets left behind,” Costache Mugurel wrote on his personal Facebook page following his rescue on Dec. 9, according to Mashable. It occurred following an apartment fire in the city of Pitesti. Mugurel had helped rescue the dog’s 51-year-old-owner when he discovered the little dog, unconscious on the sidewalk. His training immediately went on autopilot; he began performing CPR. Video posted to Facebook by local journalist Costi Tudor shows him delivering chest compressions and mouth-to-mouth and then, miraculously, about 30 seconds in, the dog regains consciousness and Mugurel places an oxygen mask over its face to stabilize him. The dog was later treated for smoke inhalation at a veterinary clinic, per Mashable. The dramatic footage has been viewed more than 2.5 million times and shared more by more than 12,000 people. Countless people from across the globe lauded Mugurel for the feat on Facebook Monday.